200 delegates are expected to gather in Ankara on 10-12th November for the Turkey Defence Week 2015, hosted by global Summits organiser, IRN. The Turkish defence industry has undergone dedicated efforts to create advanced and modern defence infrastructure, creating vast opportunities for militaries and defence companies worldwide. Given the recent rise of international terrorism and insurgencies across the globe, the need for militaries and armed forces worldwide to invest in modern defence equipment has never been greater. Turkey is looking for co-production and technology transfer agreements with international partners to reach its target of $25 billion in defence exports by 2023. Over the past two decades, the Turkish defence industry has undergone dedicated efforts to create advanced and modern defence infrastructure, fulfilling the requirements of the Turkish Armed Forces and creating vast opportunities for militaries and defence companies worldwide. 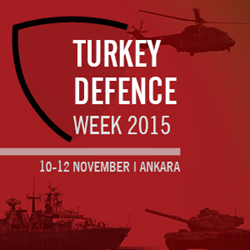 The upcoming Turkey Defence Week 2015, hosted by IRN on 10-12 November in Ankara, Turkey, will include three exclusive technical streams exploring land, naval and airborne capabilities to assess the latest developments and opportunities within battle tanks, artillery, torpedoes, submarines, fighter jets, combat UAVs, missile defence systems, electronic warfare, satellite avionics, attack helicopters, and more. The senior level conference and exhibition represents a very unique networking opportunity for defence companies wishing to increase their sales in the Turkish market, as well as for militaries seeking improvements to their army capabilities. 200 delegates are expected to gather in Ankara for the meeting to benefit from a number of panel discussions on the challenges and solutions on key topics currently surrounding the international defence industry. The forum will also include a pre-conference Workshop day to help delegates understand the principle of the Industrial Participation/Offsets (IP/O) guidelines and essentials to take part in defence projects in Turkey. The official Twitter hashtag to join the discussion is #TurkeyDefence.